We’ve already shared many of our favorite Putumayo World Music CD’s with you. We love that they focus on introducing children to other cultures, and they are a blast to dance and sing along to! 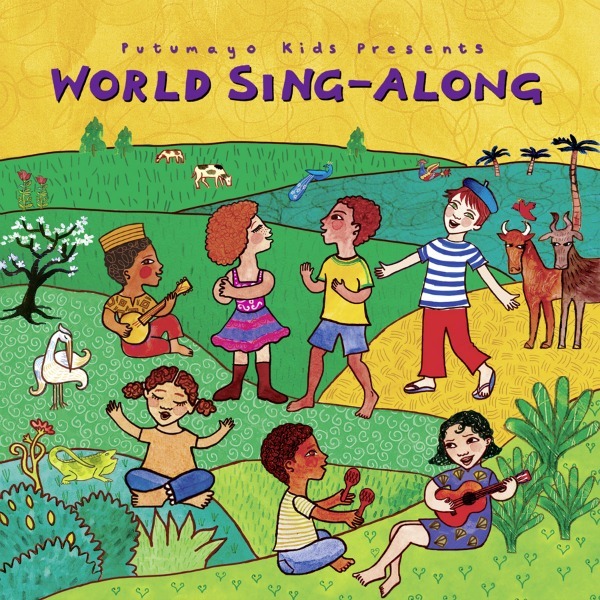 Putumayo just released the World Sing-Along CD that features family-friendly jams from around the world. There are a lot of catchy songs to enjoy including two Spanish songs by artist Jorge Anaya who sings a cumbia version of “La Cucaracha,” and Jose Conde and Ola Fresca who sing a salsa tune, “Pititi y Titi.” Our bilingual niños can also enjoy “A Little Mandarin” with Shàng Xué Gē, and Portuguese with the greeting song, “Como Vai” by Brazilian artist Hélio Ziskind. Also in the CD will be the Pihcintu Multicultural Children’s Choir, which features refugee girls mostly from war-torn regions. What’s great about purchasing this CD is that a contribution of $5,000 from sales of World Sing-Along will be donated to Five and Alive , a non-profit campaign whose goal is to ensure that every child, regardless of where they are born, reaches the age of 5. Other great things going on over at Putumayo World Music are the launch of the weekly children’s radio show World Playground with Putumayo on Kids Place Live which is on Sunday’s at 10 a.m. EST on SiriusXM Kids Place Live channel. Also recently launched is the Children of the World 2013 calendar which features photographs of kids from around the world shot by Jon Kaplan and it includes over 300 international holidays. Only 65 short of a holiday per day ! This is a great way for us and our niños to become aware of other cultures celebrations and learn a little every day. Ten percent of Putumayo’s sales of the calendar will be contributed to Seva, a nonprofit organization which builds sustainable health programs for people in need. The album is now available on CD and digitally from Leapfrog’s App center November 6th. It includes 11 lively songs which you can take a listen to here ! My kiddos and I love these types of CDs and music. We have dance parties and love the catchy music. I love it when the songs are simple to learn. I am and email subscriber. This is awesome! I’ve been struggling to put a mixed playlist together. My kids love music! We own several Putumayo collections and love the music they put together. My grandbabies are such hams (have no idea where they got it from) that they love todo que tiene que ver with music and dance. They’d ♥ esto! Thanks for the giveaway. I’ve never had a chance to listen to this. Sounds like my 5 year old would love it! I love Putumayo. Just today we were listening to Brazilian Playground, so far the only one “for kids” I have. I didn’t know Putmayo put so much back into charity! What a great investment all around! We’d love new exposure to the music and the calendar is a great idea! Putumayo rocks! What a great way to infuse some cultural and language diversity to kiddos. Thay love to sing & dance! Anything you can dance to my daughter loves! My 3 year old just started at a bilingual school and she loves listening to spanish songs in the car. I only have 1 and I need more! We love Putumayo Kids compilations! Will be a hit in our family!